When it is my turn to be on watch, I put on my underwear, thermal underwear, Bermuda length woollen pants, full length woollen pants, wind-stopper trousers, offshore overalls, woollen sweater, thicker woollen sweater, fleece vest with wind-stopper lining, offshore jacket, thick down vest, two pairs of woollen socks, Alaska boots, gore-tex mittens, fur hat, and, in rough weather, the goggles. 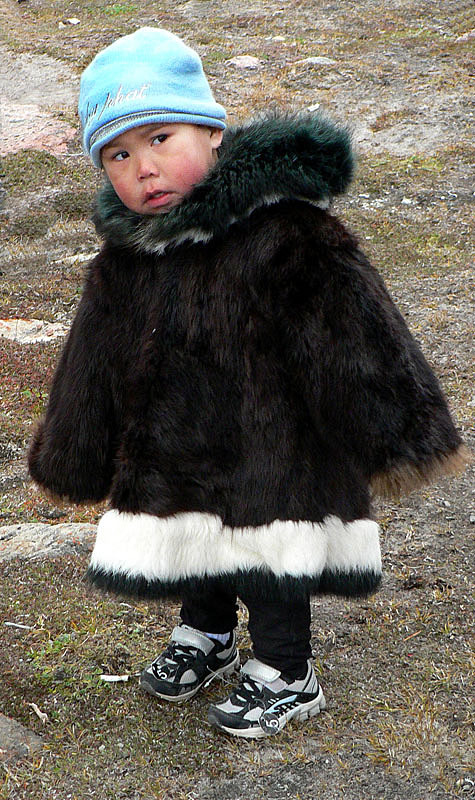 And, voilà, I am all dressed up for the Arctic Summer! 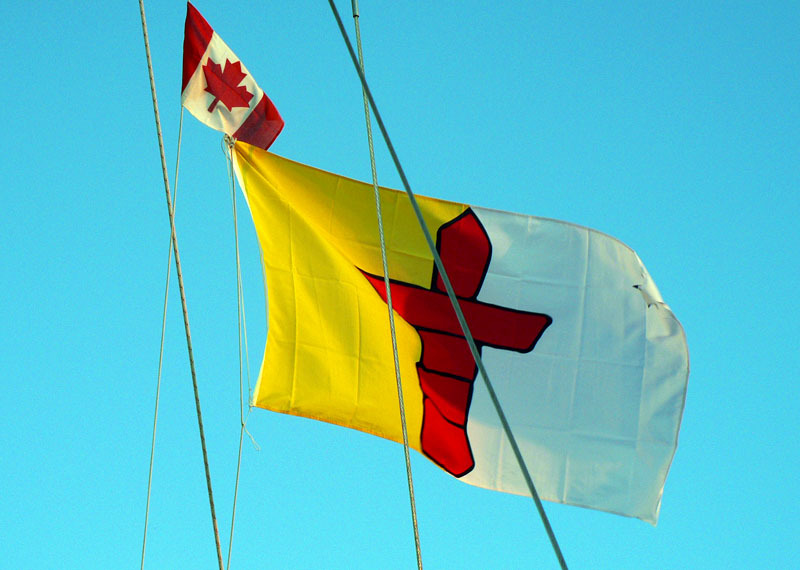 For the rest of the day and the following night, we continued tacking towards Barrow Strait. In the early hours of the morning, we were engulfed in fog, you know, the 'when you stretch your arm, you can't see your fingers' kind of fog. And the fog kept us in its grip for the next 36 hours. So, it was grey, damp and headwind all over again! As we reached the end of Peel Sound, the skies cleared, the wind died, and the sea was smooth as silk. We motored near the rugged coastline of Somerset Island for the sole purpose of spotting a polar bear. Mathieu had told us that often when he took Tico ashore, sooner or later a polar bear would appear. 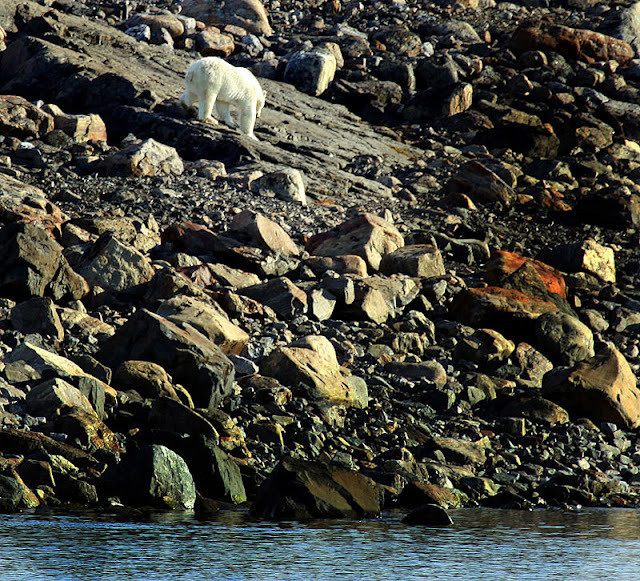 So, if we didn't see a polar bear, we had contemplated taking Latte ashore as decoy. For your information, that won't be necessary as we soon saw a lone bear on the shore. Unfortunately, the bear was too far away for any decent photos but through the binoculars, we could see him descend the slope and as he came to a snowy patch, we watched him roll and slide on its icy surface. We are now heading for Erebus Bay to the other side of Barrow Strait. The reason for this is that during one of the continuous tacking manoeuvres, our jib came tumbling down. We are now negotiating who is the lucky one that will be lifted to the top of the mast. 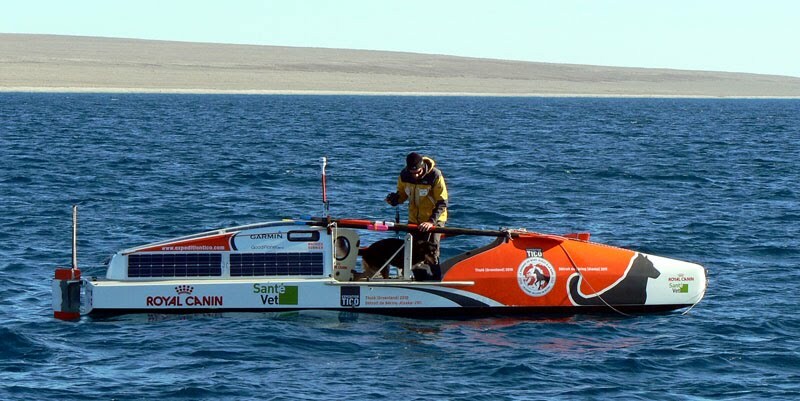 Yesterday, we had the pleasure of meeting Mathieu Bonnier, a French veterinarian who explores the Arctic in the company of his dog Tico, by rowing (http://www.expeditiontico.com). We heard from Peter that Mathieu was somewhere near Tasmania Island coming south and, therefore, we kept a sharp lookout. Before we spotted him, however, Mathieu who was also aware of our presence in the area, contacted us via VHF. We arranged a rendezvous and invited Mathieu on board. We spent the next couple of hours exchanging information about the Passage and listening to his fascinating stories about rowing, skiing and dog-sled racing. 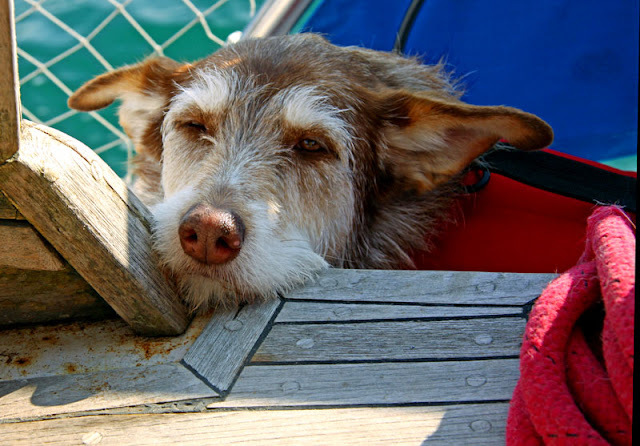 All the while, we were towing his rowing boat and dog, and about ten miles further south, we dropped him off in a bay where he took Tico for his daily walk, before continuing his laborious journey towards Cambridge Bay. 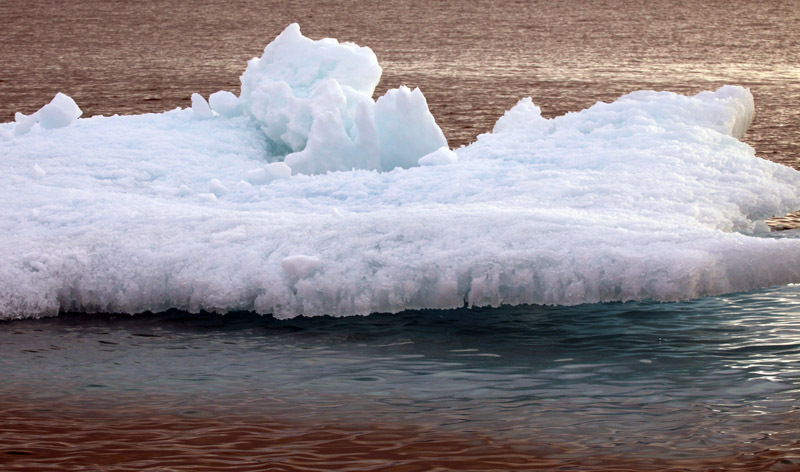 Oh yes, we have seen quite a few bergy bits during the past 24 hours. They did not come as a surprise as Peter had warned us about these blocks of ice that are like miniature icebergs, made of thick, old ice. And, mind you, they are small only in relation to the proper icebergs! The bits were exactly where they were supposed to be, starting from Larsen Sound and continuing to Franklin Strait. We had headwind (surprisingly!) and when tacking off the coast of Boothia Peninsula, we soon saw a lot of ice ahead of us, both bergy bits and smaller floe ice. 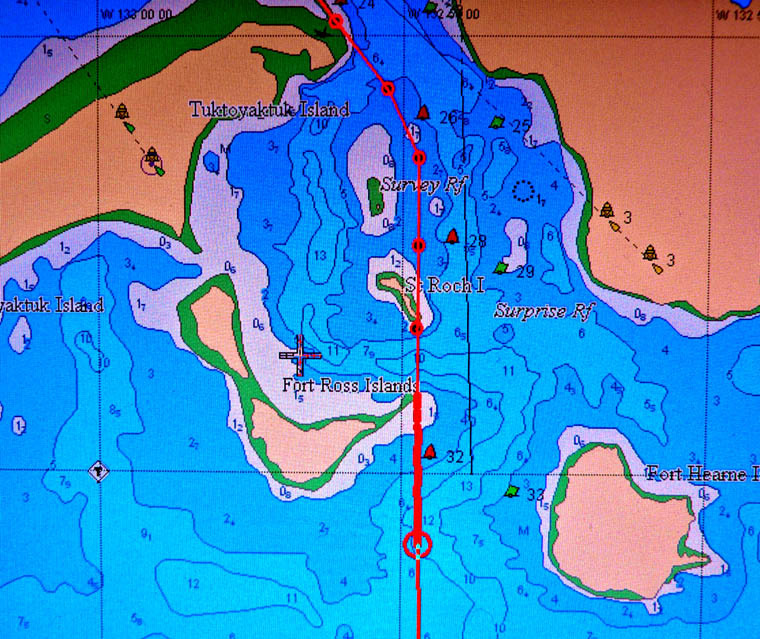 We immediately changed our course and headed back towards the coast. Henceforth, we continued hugging the shoreline until dawn. The two good things about bergy bits are that they like to float alone without the company of other bergy bits, and that because of their size, they can be easily spotted except at night, of course. You may already have guessed when we were in the worst bergy bit area: in the middle of the night, during its darkest hours, naturally! This meant that we were both awake all night trying to see the bits that showed on the radar and the possible other bits that did not. Again, many of the bits became visible only after we had passed them but here the reason was obvious. 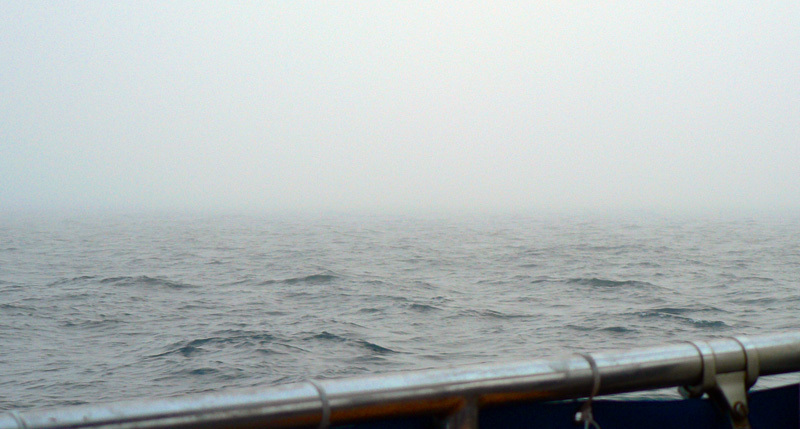 As we were heading north, the bits in front of us were backlit and, hence, disappeared in the dark seas. For this particular leg, we have adopted a daily routine that is quite different from what we normally have: because of the ice, both crew members stay awake from dusk till dawn. At the crack of dawn when the visibility has improved sufficiently, the more tired crew member goes to sleep, after which we have breakfast together. 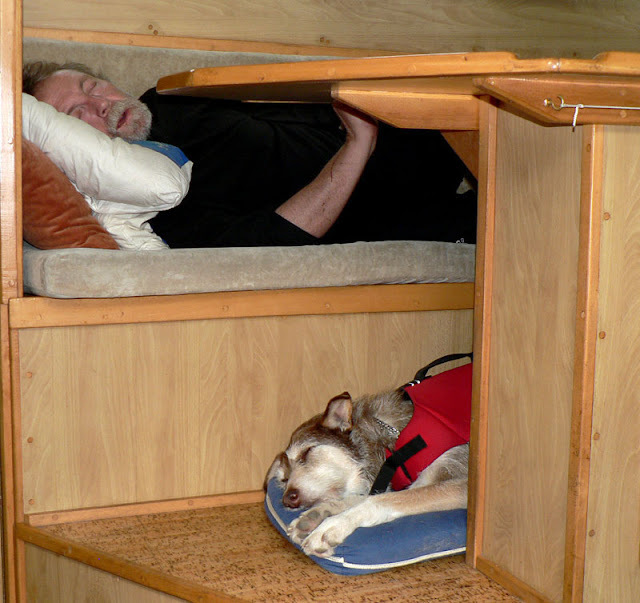 Then, the other crew member goes to sleep, after which we have lunch. Thereafter, we take turns in resting but the main thing is that one of us is always on watch. This continues till dinner time which is around nine, after which both of us must stay awake and keep a sharp lookout for ice. We have learned from bitter experience that when there is nobody on watch, the ice will find us. For this reason, we are determined to stick to the above routine until we are absolutely clear of these ice-infested waters! Today, we had also another good reason for keeping a sharp lookout, but we'll tell you more about that tomorrow. To prevent this becoming too serious, and as we seem to have ample time, let's continue our language studies. 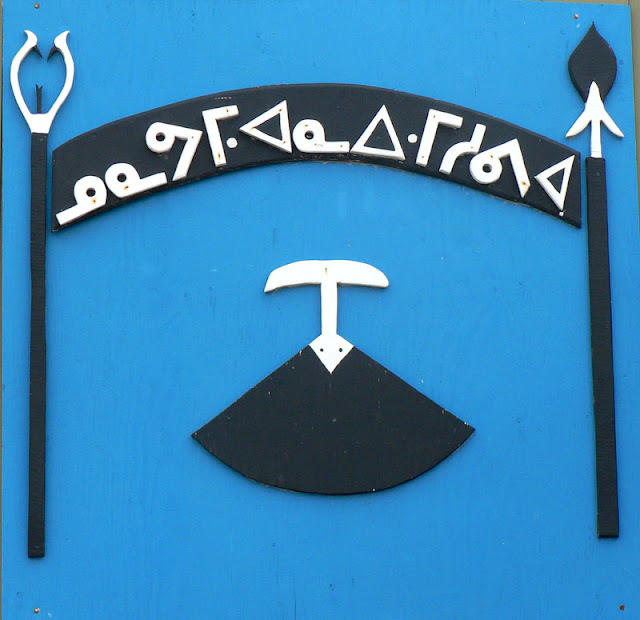 Inuinnaqtun and Inuktitut are the official native languages in Nunavut. 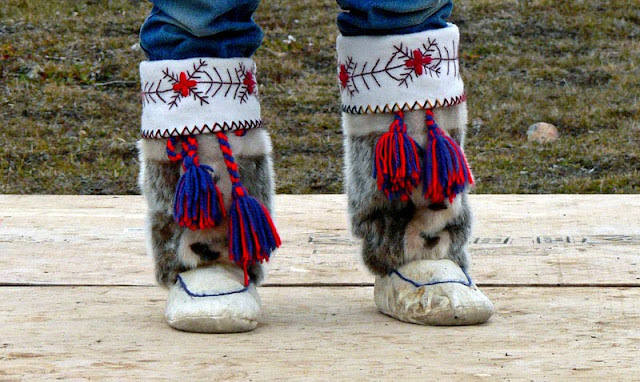 In the Northwest Territories, the official native languages are Cree, Chipewyan, Inuvialuktun, Inuktitut, Inuinnaqtun, Dogrib, North Slavey, South Slavey, and Gwich'in. Your homework is to find out what language the above sign is in and translate it into English. Just take your time! 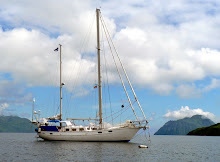 We dropped anchor in the protected harbour of Gjoa Haven on Sunday evening at ten to eight. 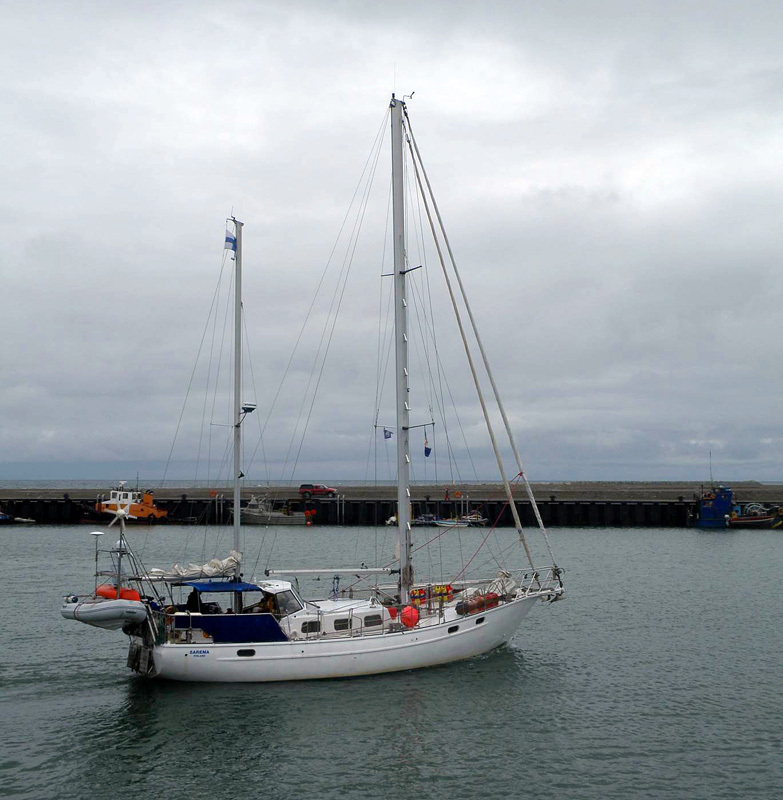 Young Larry, the British sail boat that we knew from Peter's radio net was already there, but there was no sign of RX2. The following morning, we received an email from the Norwegian sailors explaining that they had continued past Gjoa Haven as the waters ahead were practically ice-free. They are in a hurry because they want to get across the North Atlantic before the autumn storms, on their way back to Norway. It was a pity as there was a memorial to be held in honour of Roald Amundsen later that day, and there were no Norwegian boats present. At four o'clock in the afternoon, all the locals plus the crews of Young Larry and Sarema were gathered on the hill facing the hamlet. Speeches were given by both the Mayor of Gjoa Haven and the Norwegian Ambassador, the flags of both countries were raised on brand-new flagpoles, and a thousand photos were taken. As it was all about Roald Amundsen and Norway, and since we had promised RX2 to represent them during the festivities, we tried to look as Norwegian as possible. We think we did pretty well! Later the same evening, on receiving the daily ice chart, we came face to face with the sombre reality. For some unforeseeable reason, the ice further north had shifted and blocked Franklin Strait. And in Larsen Sound, it had also moved eastward and was now less than fifteen miles off the shore. This will keep us in Gjoa Haven for a little longer but hopefully not for too long! It is icy cold and foggy as we negotiate the narrows leading to Gjoa Haven, a place named after Roald Amundsen's ship Gjöa, the first vessel ever to navigate the Northwest Passage. For Amundsen, the voyage took a total of three years (1903-1906). We hope that our crossing will be considerably shorter! From Gjoa Haven, we will begin probably the most crucial leg of our voyage and, henceforth, it is going to be all about ice! The ice will dictate all our movements; when we can go, which way we should go and how far we are able to go. This means that we have to continuously follow the movements of the ice that can sometimes be unbelievably rapid and unpredictable. We have two sources that provide us with information, our support person back in Finland, Esko Pettay, who sends us ice charts by email and Peter Semotiuk in Cambridge Bay who reads us the daily weather report on the radio and emails ice charts as necessary. On the charts (by Canadian Ice Service), the ice concentration is marked in different colours; white means open or ice-free water (our favourite! ), blue means less that 1/10 ice, i.e. 10 % ice coverage, green areas have 1/10 – 3/10 ice, yellow areas are covered by 4/10 – 6/10 ice, orange areas by 7/10 – 8/10, and red areas by 9/10 – 10/10, i.e. solid ice. Besides the ice concentration, also the size, type and thickness of the ice are of significance when planning our ongoing voyage. In reality, all coloured areas except blue and perhaps green are impassable for Sarema. And we will do everything in our power to avoid going into areas coloured yellow, orange or red! So, understandably, we are studying the ice charts with ever increasing interest. 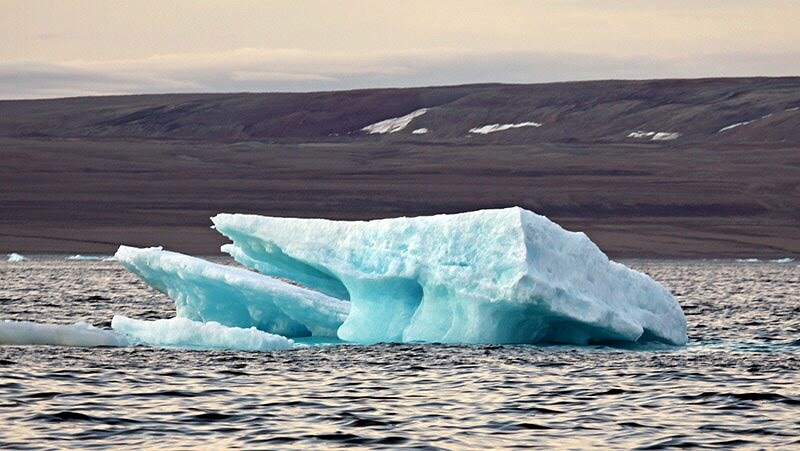 At the moment, the east end of Bellot Strait is still blocked by ice, and if the situation does not improve by the time we have to proceed through preferably ice-free Peel Sound, the only option left is to continue north and sail around Somerset Island. This would mean one extra day's sailing. Since the ice is melting at an increasing rate, the blockage could disappear within the next few days or with luck, the winds will sweep the ice south down the Gulf of Boothia and clear the passage for us. For now, there is nothing else for us to do but wait and hope for the best! While waiting for the ice to melt, we decided to give you a crash course in two native languages. But first, a few words about the natives themselves. In Alaska, Eskimo is a commonly used word that refers collectively to both the Yupik and the Inupiat tribes, whereas in Canada, and in Nunavut in particular, you should never use the word Eskimo as it is considered to be pejorative by the natives. 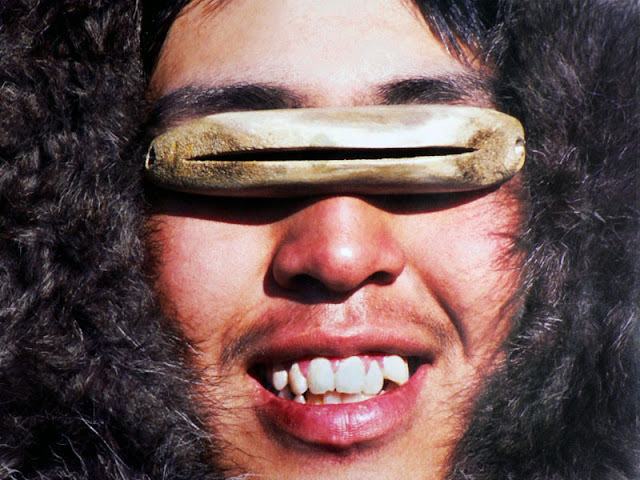 They call themselves Inuit, and so should we. Now, back to the languages. There are several native languages and dialects, some on the verge of extinction, some still in everyday use especially amongst the old. Here, we have chosen two of the most widely spoken languages, namely Iñupiaq used by the Alaskan Eskimo and Inuinnaqtun spokenby the Inuit. As you can see, many of the words are the same in both languages and then again, some words are completely different. From personal experience, we can say that if you ever contemplate visiting the Polar Region, the word to memorize is ALAPPAA! Due to favourable currents and lack of headwinds, we arrived in Cambridge Bay already on Wednesday, almost half a day earlier than predicted. We had enjoyed the most glorious weather for the past two days, and it felt as if this too had speeded up our journey, although we are not quite sure if sunshine has ever actually helped increase a boat's speed though it definitely raises the crew's spirits. Our plan was to stay in Cambridge Bay only for two nights, in other words, long enough to get fuel, buy some vegetables, and upload a few pictures on the blogs. Among sailors, the remote hamlet of Cambridge Bay is known for three things. Firstly, it is the final resting place of Roald Amundsen's vessel the Maud which was launched in 1917 and became an ice-locked research vessel drifting in the polar pack ice. The ship served Amundsen on two voyages crossing both the Northeast Passage and most of the Northwest Passage. In 1926, the ship was purchased by the Hudson Bay Company and used as a supply vessel and finally, a floating warehouse and a wireless station until she sank here in 1930. Secondly, it is the summer home port of Peter Semotiuk who is the guardian angel of most of the crews that try to navigate the Northwest Passage, providing them with up-to-date weather and ice information and taking care of their needs in numerous ways. Thirdly, it is the only place where children are known to throw stones on visiting boats. Nobody knows the reason for this odd behaviour which has continued for years. We were aware of the nuisance since most of the boats that had visited Cambridge Bay had complained about it on their blogs. Therefore, we were very surprised when nothing happened the night after our arrival. We even naively thought that this nasty tradition no longer existed. We could not have been more wrong. The next morning, the crew of RX2, the Norwegian boat that we had already seen in Nome, told us that their deck was full of stones every morning, and the reason why nothing had happened the night before was that the big tugboat that was moored next to us, had placed a guard on the jetty for the night. Both the tugboat and RX2 left the next day leaving us the only remaining target for the stones. So, in order to guard our precious sleep, Riitta stopped the first mounted policeman she saw on the street and requested Police Protection! The policeman who was very sympathetic, told that they were aware of the problem, but there was very little they could do about it. However, he promised to see to it that their patrol car would stop by the jetty a few times during the night. We will never know whether it was the police patrol or the miserable weather with a heavy drizzle that kept the children away but, for the second night running, not one stone landed on our deck! As we didn't want to push our luck, we decided to stick to our original plan and leave for Gjoa Haven in the morning. We left Cambridge Bay early next morning or so we thought. While still inside the bay, our autopilot refused to keep proper heading and as it was blowing 35+ knots, we decided to turn back. However, we didn't want to go to the village dock in fear of being stoned so instead we sailed into the bay where Amundsen's Maud had sunk. We dropped anchor on the opposite side of the bay not only to pay homage to Amundsen and his Maud, but also because small aircraft use the other side of the bay as their runway. While anchoring, we saw a floatplane reversing from the end of the bay. Its captain was clearly curious about us, maybe the only sailing boat he had ever seen anchored in the bay, as we could see him peeking out of the cockpit's open window. Just as I was saying to Pekka that it looked as if the aircraft was going to hit the small rocky island behind us, it did exactly that! We could see pieces of the plane's floats fly in the air and the surprised or even shocked expression on the pilot's face when he realized what had happened. It took just a few seconds for the pilot to make up his mind. He then accelerated and took off with the damaged floats. We do hope we are not to blame for the loss of an aircraft! During our third day at sea, the fog lifted, the skies cleared and finally, we had sunshine! It is amazing how much the quality of life improves when you can see where you are going! In the evenings, we watch in awe as the sun disappears behind the horizon and its rays paint the sky and the sea with the most astonishing colours. 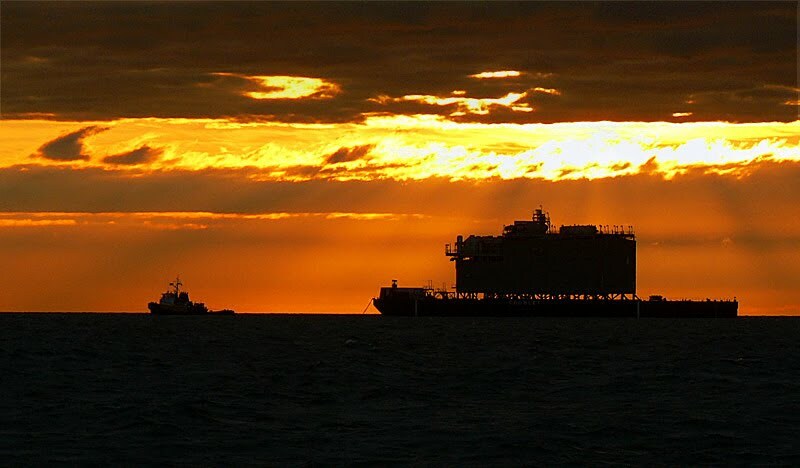 Although the sun stays behind the horizon a little longer every night, we still have nearly 24 hours daylight which is of great help when negotiating the narrow channels of the Passage. We are presently motoring along Coronation Gulf between Victoria Island and the mainland. Since we left Tuktoyaktuk about four days ago, besides Sarema's crew, we have not seen another living creature in this godforsaken place, not in the sea, on its shores or on the radar. On both sides of the Passage, the land stretches away brown, rocky and desolate; it looks like a moonscape without the craters. There is not a tree or shrub to be seen. To describe the landscape, deserted, except that we doubt if anyone ever lived here, and barren are further adjectives that come to mind. It is difficult to imagine a place more lonely and empty than the Arctic. 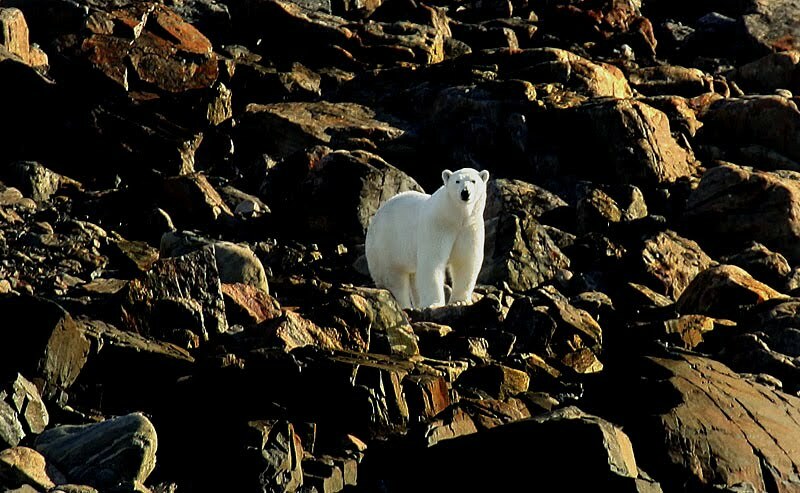 Speaking of empty, the Arctic wildlife or actually the lack of it has been a huge disappointment, especially to Riitta who has been in constant readiness with her camera, and being an optimist, continues to be so. Our sightings so far, all seen from a distance, comprise birds; mainly seagulls and a few flocks of eiders, maybe two dozen seals; harbour and ringed seals, a total of two caribou, and a lone whale that we were unable to identify because we only saw its blow. All that put together amounts to less than what we often sighted in one single day while sailing in southwest Alaska. The truth is that here in the Polar Region, where there is ice, there is life, as strange as that may sound. Ice is a crucial element for the Arctic wildlife and every year, there seems to be less and less of that precious commodity! I hate to repeat myself but it really has been awfully grey up here on the Arctic Ocean. On Thursday evening, which was our last in Tuktoyaktuk, the sun came out for a few hours and everything looked Oh, so bright and beautiful. We even talked about wearing T-shirts the next day and getting suntanned. Understandably, our hopes were high when we woke up the following morning and what did we see, nothing but GREY! We were completely enveloped by fog as thick as pea soup, except not green but grey. The fog had rolled in during the night and did not lift until late Saturday afternoon when we were well on our way to Cambridge Bay. There were a few clearer patches every now and then, but most of the time we were engulfed in thick, damp fog with no visibility to speak of. Until now, the radar has been our only means to detect anything there is to detect which has been absolutely nothing so far. It is as if we were the only vessel in Amundsen Gulf which, of course, could well be the truth. We know that there are boats coming from the east but they are all still on the other side of Peel Sound waiting for the ice to retreat. So, we continue our lonely transit towards Cambridge Bay where we should be sometime next Thursday, weather permitting. 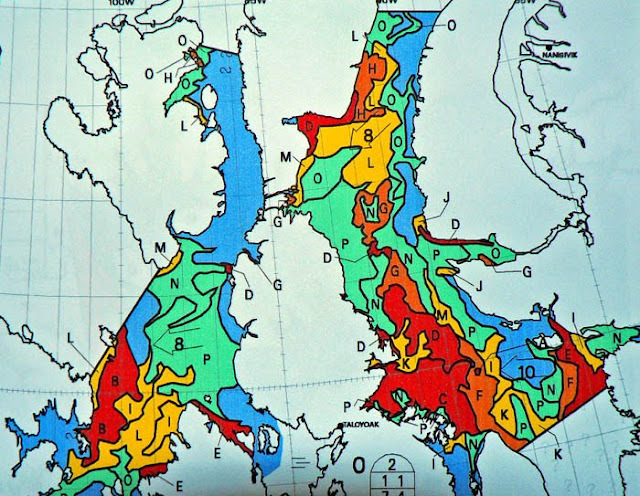 There are a few anchorages along the way but we have decided to use them only in case of emergency. Our goal is to get to Cambridge Bay as soon as possible, take fuel, hopefully find internet connection and then continue straight to Gjoa Haven, which is the place to be when Peel Sound opens up. At the moment, we take one day at a time, and try not to worry too much about the future. Even though this message reached us too late, it was still good to know the reason why the ice had been so much further south than we had anticipated. We ended up staying in Demarcation Bay for three nights due to the fog, the rain and the headwind. We left the Bay on Sunday morning and a few hours later crossed the US – Canada border at 2.06 p.m. and arrived in Canada at 4.06 p.m., skipping one time zone altogether. The skies had now cleared but the headwind had remained and as a result, we were forced to tack, and mind you, Sarema is no good at tacking, for a total of two and a half days and about 80 extra miles till we arrived in the hamlet of Tuktoyaktuk late Tuesday evening. In the long, winding and shallow channel leading to the harbour, we experienced a few uneasy moments when our new NavPak-Pro showed us sailing on the wrong side of the buoys and over reefs and islands. There is obviously a chart datum error in the program that has to be corrected. Thank God, we never rely on one single navigation aid, and use our common sense and seamanship at all times! Thanks to the two-day tacking, we woke up next “morning” at around 2 p.m. and after hurried breakfast, dinghied ashore to check us in Canada. The pleasant office staff of the Royal Canadian Mounted Police took care of all the formalities for us, and after about an hour, we were officially in Canada. We were also advised how to arrange a visit to the only place that we really wanted to see in Tuktoyaktuk, i.e. the community Ice House. It is a small building the size of a kiosk and inside, there is a hole in the middle of the floor with a cover on it. The cover pulled aside, we climbed down a ladder and found a natural freezer dug in the permafrost about eight metres below ground. 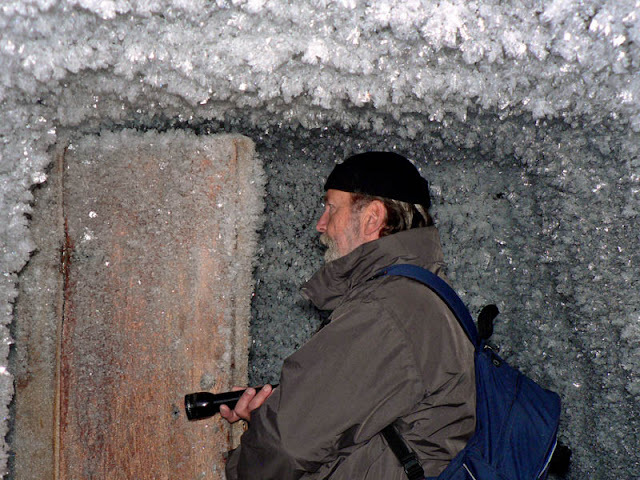 It is an ingenious invention used for thousands of years by the Inuit but as summers become warmer and longer-lasting, the time of ice houses is coming to an end, as everything related to permafrost which is melting at an alarming rate. 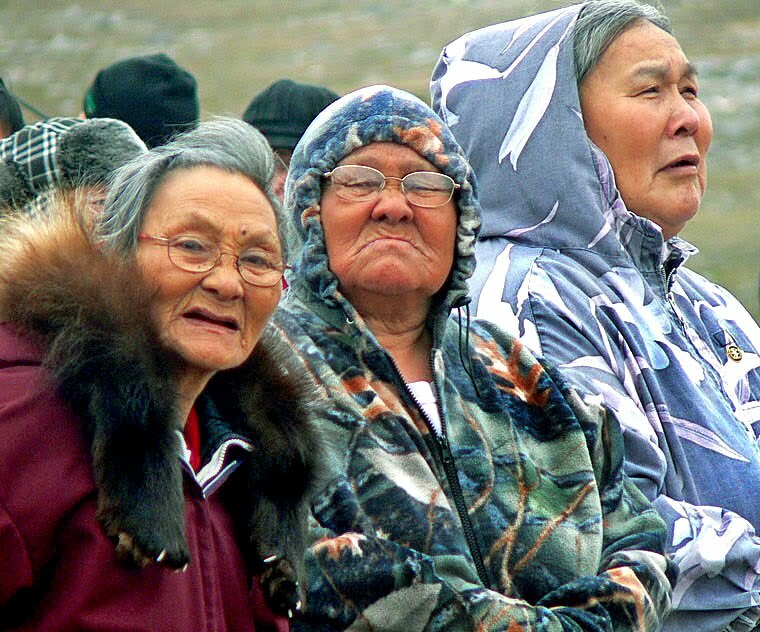 Due to the climate change, it seems evident that Tuktoyaktuk will also lose its second most popular tourist attraction, namely the pingos. A pingo looks like an ordinary hill but is, in fact, a hill of solid ice covered with a layer of soil thick enough to provide a rooting ground for plants. 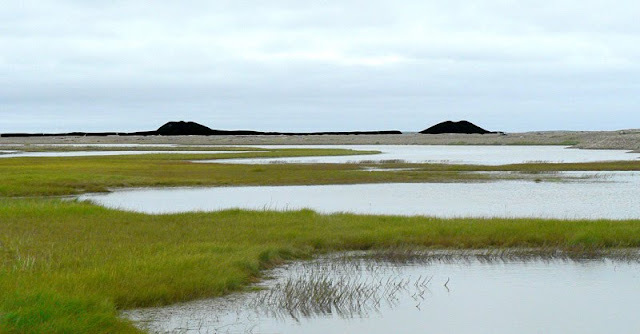 There are hundreds of pingos on the Tuktoyaktuk Peninsula, all slowly but surely melting away. We are now anchored in front of Northern Store, our tanks full and ready to leave tomorrow morning for Cambridge Bay. 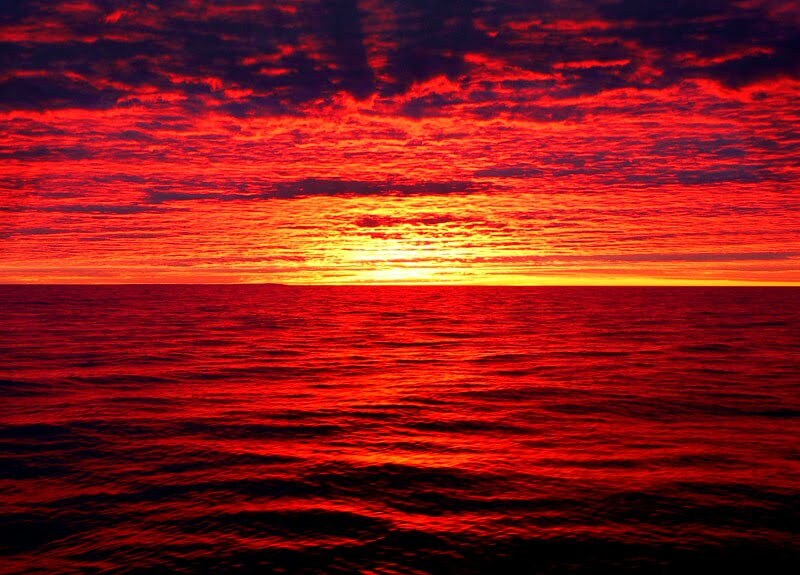 For the next five or six days, we will be at sea again but, this time, the waters should be completely ice-free! This is not to point the finger at anyone in particular but the truth is that the member of the crew who was supposed to be on Ice Watch fell asleep. The gale on roller coaster seas with very little sleep had clearly taken its toll. So, at around midnight after passing Point Barrow, we woke to a hellish bang and hideous scratching sound that came from the sides of the boat. We had run into ICE! We were up on deck in a fraction of a second, and Pekka managed to turn the boat just as she was about to crash against a block of ice. We had thought that the ice was much, much further north but obviously we were wrong. 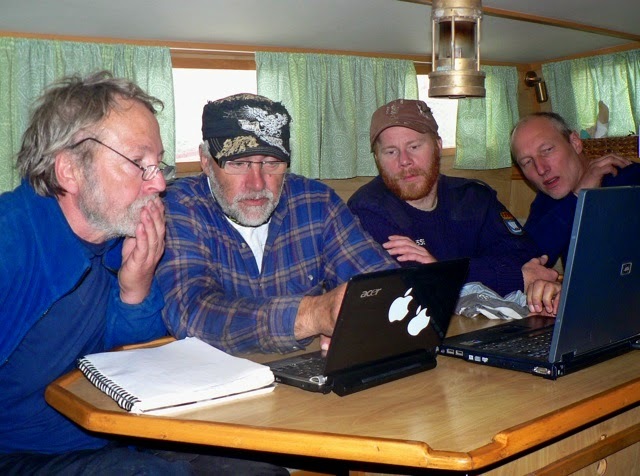 Later the same day, the other crew member who was supposed to be on Ice Watch was playing with the computer when there was a horrible bang at the bow and Sarema came to a halt. This time it was less dramatic, though, only one not-so-big ice block that was split in two as a result of the collision. The strange thing about this incident was that we had the radar on but the ice block did not show on the screen. It was only after we had hit the ice that we could see it on the radar. We have now learned our lesson(s) and will never ever again underestimate the importance of ice watch! 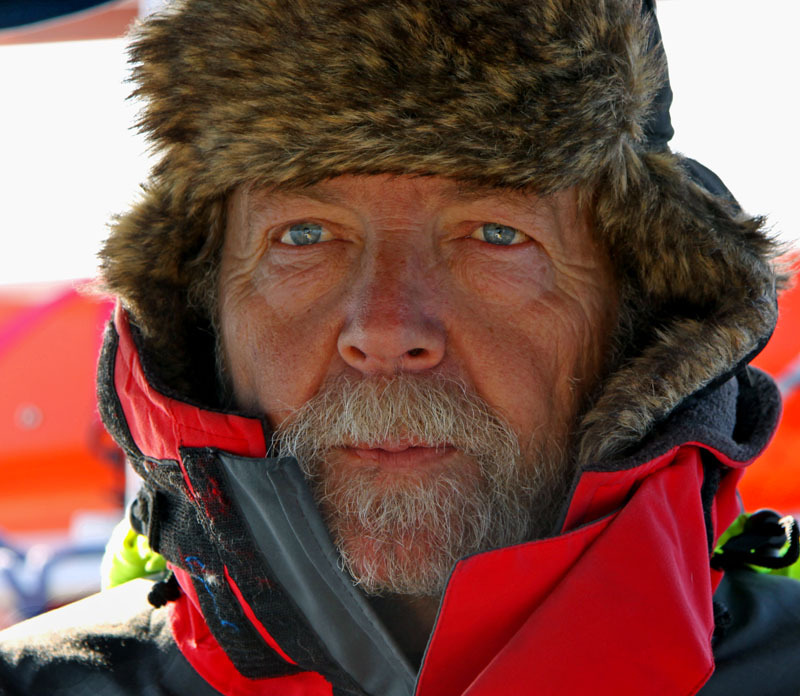 After the close encounter at night, we had decided to sail closer to the shore in order to avoid the pack ice. 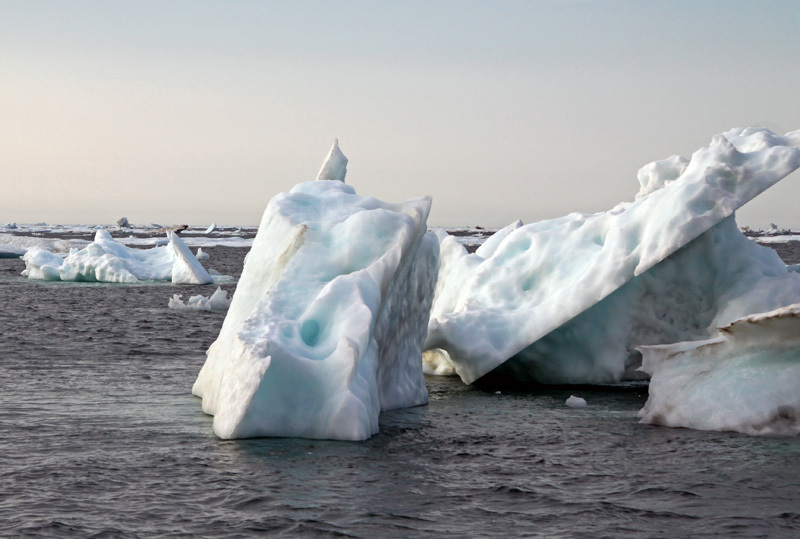 However, there was still plenty of floe ice floating around the boat and keeping us busy at the helm but as there was ample space to manoeuvre, we actually enjoyed the zigzagging. It was a lovely and somewhat peculiar day in many respects. The skies were blue and the sun was shining which was just wonderful after so many grey days. We cherished the light and the warmth which also gave us additional pleasure in the form of mirages. We had read about the Novaya Zemlya Effect but had no idea how magnificent and fascinating this phenomenon could be: on the horizon, we could see a white wall of ice reaching the skies, objects that were actually behind the horizon were floating in the sky above us, ice blocks growing into gigantic proportions with their mirror image hanging above them. The Arctic is a truly magical place and since that day, we have had the privilege of enjoying this magic almost on a daily basis. It was plain sailing till we arrived at Prudehoe Bay and saw, in front of us, a wall of pack ice that looked absolutely impenetrable. The captain of a tugboat that was motoring close by called us on the radio and told that he had been trying to get through the ice for the last eight hours, that he would give it one more try and if he didn't get through, he would continue trying the following morning. He recommended that we should try the shallow passage between the shore and a chain of small islands that was ice-free. We watched as he tried in vain to penetrate into the mass of ice. After a while, he gave up and returned to the open water. It was clear that we should follow his advice, and for the next twelve hours or so we motored along the inside passage to its last entrance (Mary Sachs) that was deep enough for Sarema to exit. On our port side, the wall of pack ice as high as a skyscraper (Novaya Zemlya Effect) continued haunting us all the way to the entrance and beyond. Near the entrance, we saw a helicopter hovering above an oil drilling platform. Pekka contacted its pilot via VHF because the view from the helicopter was far better than from where we were. The pilot told that there was a few miles wide stretch between the pack ice and the shore and, though it was filled with floe ice, she thought it could be navigable and that after Barter Island, the waters were practically ice-free. We managed to get through the maybe a little too shallow Mary Sachs Entrance without major difficulties (only one grounding). After leaving the protected passage, we used all our time and energy trying to avoid hitting the ice blocks floating around the boat. For hours and hours, we navigated through floe ice and growlers which required quick reactions and concentration. This was quite tiring and gradually, we began to feel a bit oppressed amidst all that ice that stretched away as far as the eye could see. We spent a total of 46 exhausting hours navigating through the field of ice but fortunately what the helicopter pilot had said was true and, as we approached Barter Island, there was no more ice in front of us, and we were finally free! Because the weather forecast was 25 knots east i.e. headwind and since we really had a lot of catching up to do sleep-wise, we headed for Demarcation Bay, about five miles off the Canadian border. This was the first time we anchored since Nome, and we are going to stay here for the next two days doing some necessary maintenance work on the boat, relaxing and also celebrating the excellent progress we have made so far in the Northwest Passage! The gale started late in the afternoon with the predicted 35 to 40 knot winds. Soon, the waves started to increase in height and eventually, it was as if we were riding on a roller coaster with steep ups and downs due to the sharpness of the waves. We had set the radar to sound an alarm in case floe ice drifted into our vicinity. However, the breaking waves caused the radar to give a false alarm every five minutes or so, and we had to switch it off. We remained hove to for the next 34 hours and during that time, we drifted, aided by a strong current, approximately 30 nautical miles back towards Barrow. We assumed that the strong south-westerlies had now shifted the ice after Barrow further north and that there would be a lead between the ice pack and the shore. So, when the winds decreased to some 30 knots, we set sail again and continued our disrupted travel towards Tuktoyaktuk. As of today, an addition has been made to the already existing range of colours that surround us. The palette now consists of Grey, Grey, Grey, and Turquoise, the colours referring to the sky, the sea, the land, and the ice, respectively. Yes, this morning we saw ice for the very first time; there were huge blocks of floe ice all around us as we negotiated our way towards Barrow. 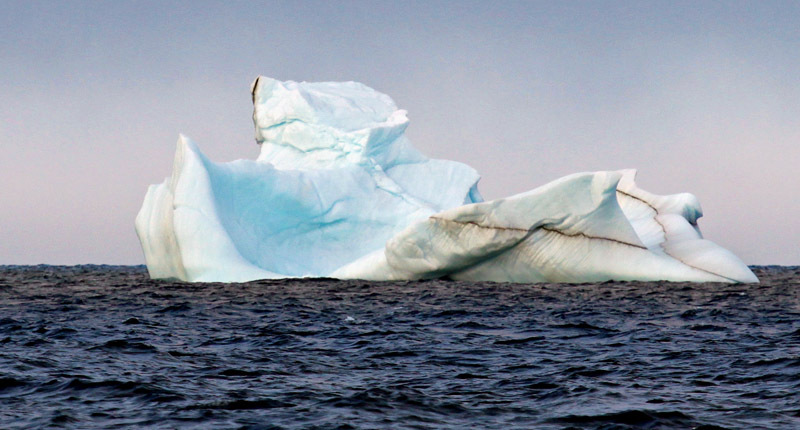 They were not gigantic (although, I think the Americans still call them icebergs) but big enough to be of concern. Consequently, a 24-hour Ice Watch has now come into effect on board Sarema. The weather forecast was another thing giving cause for concern as we neared Barrow. There was a low pressure area approaching us from south-west with 35 to 40 knot winds. Now, the direction of the wind was good because it would probably sweep the ice off the coast but, of course, its strength was something to worry about. The Chukchi Sea is very shallow with less than 20 meter depths around Point Barrow. After Barrow, there was a large area of fast ice which, as far as we knew, was still attached to the shore blocking our way to Tuktoyaktuk. Since Barrow does not have a harbour, and the lagoon in front of the town has an average depth of about two meters, we were left with very few alternatives. After carefully considering our predicament, we decided to make a U-turn and head for the open sea. At a distance of about 30 miles from the shore, we hove to hopefully far enough from the pack ice lying north of us to allow Sarema drift with the predicted winds. At the moment, we are staying put and waiting for the approaching gale! 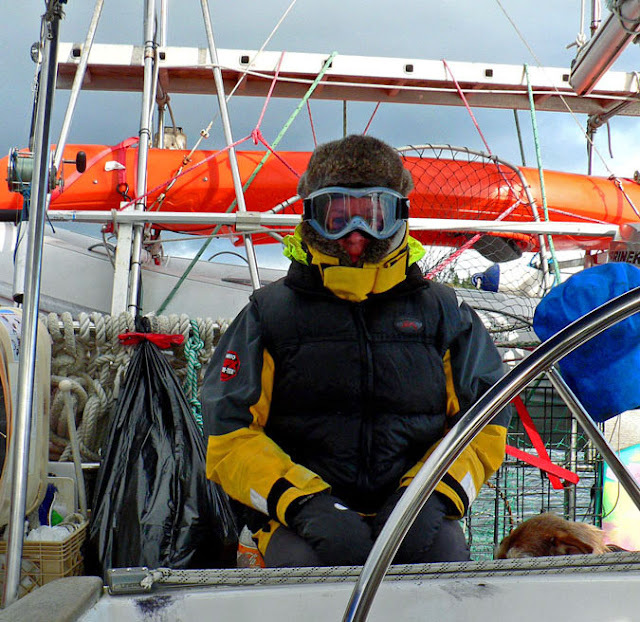 After leaving Nome, Sarema's head (= toilet) became a major issue amongst her crew. It is the only space that does not have any kind of heating with the result that, at some point during our voyage up north, it had become to resemble a refrigerator. When you opened the head door, you could feel the cold air rush towards you. And when you thought of the ice-cold ring awaiting you therein, you were more than tempted to quickly close the door in front of you. At first, neither of us was willing to admit that she/he detested the cold (we were on our way to the Northwest Passage, for crying out loud!) but, of course, the situation could not continue like this forever. So finally, after having discussed this delicate matter between us, we came up with the simplest of solutions: we tied the head door to the handle of the fore cabin door so that it would stay open permanently. After only a few hours, the head was just as warm and comfortable as the rest of the boat. Of course, we now lack most of the privacy we used to have but, after all, how important is privacy compared to a warm toilet seat! We left Nome Tuesday afternoon after having first filled our water tank and said goodbye to Deb, Rolland, and Tibo who had come to see us off. We had done some reprovisioning the day before but had not found any eggs at the grocery store. Deb too had tried to find them for us but without success. We were just about to untie the boat when she asked whether we had got the eggs as a fresh lot had arrived at the store that very afternoon. When she heard that we hadn't, off they drove with Rolland to get two dozen eggs for us. So, every time we have eggs aboard, we are sure to remember the good people of the Precipice. Outside the breakwater, the Bering Sea was surprisingly choppy but as soon as we had got the sails up and settled on the right course, sailing was pretty enjoyable. This lasted for about twelve hours after which the wind dropped and, consequently, we have now been motor-sailing for the past two days. Sarema crossed the Arctic Circle Thursday night at 00.27. This marked the unofficially official beginning of the Northwest Passage for us. To celebrate the occasion, we had the last two of Kathy's brownies and toasted our future success (!!) with a glass of wine. While sailing in the Bering Strait, we came close to the International Date Line. The idea of crossing the Line and sailing into the future was very tempting but as rational people, we dismissed it. Obviously, the fact that crossing the Line would have meant violating the Russian Customs and Immigration Laws also influenced our decision-making. At the moment, it seems that the further north we go, the less we see of the sun. We had thought it would be the other way around. So far, the weather has been cold, damp and foggy. Actually, we shouldn't be complaining since we are in Alaska and this is typical Alaskan weather. Wherever you look, whether it is the sky, the sea or a piece of land that every now and again rises above the eastern horizon, it is all grey, only in different tones. 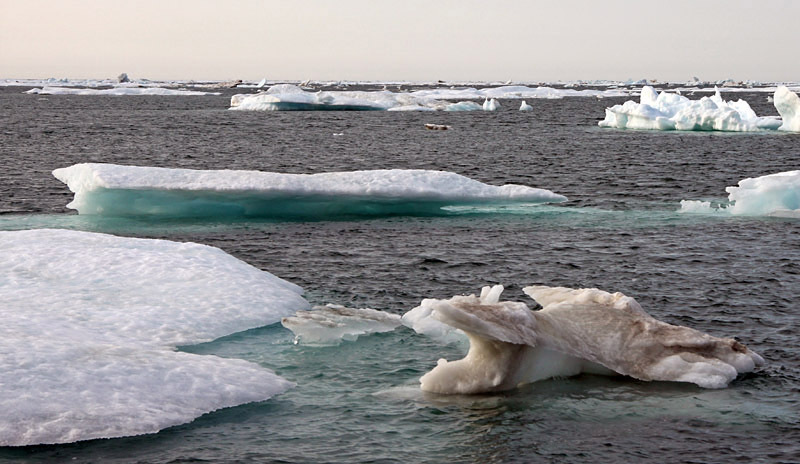 According to the Arctic Sea Ice News and Analysis, published by the National Snow and Ice Data Center, high pressure has started to build in the Beaufort Sea. Whether this will continue, remains to be seen. We sincerely hope that the Arctic High with clear skies and blue seas is somewhere up there waiting for us!